michelehagmann has no other items for sale. 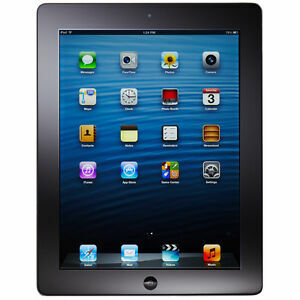 Sporting a slim and sleek design, the Apple iPad 4th Generation 16 GB tablet PC is your one-stop entertainment solution. Powered by the zippy 1.4 GHz Apple A6X processor, this Apple iPad adapts to your needs with maximum performance, extended battery life, and an unparalleled visual experience. Moreover, this Apple iPad's beautiful 9.7-inch multi-touch screen with Retina display delivers razor-sharp images and videos with vibrant colors and rich detail. With a 16 GB storage capacity, the black Apple iPad 4th Generation tablet lets you store your multimedia files, without worrying about storage issues. Plus, supporting Wi-Fi networks, this 16 GB tablet PC allows you to surf the Web and download videos and games at lightning-fast speed. What's more, with a 5 MP rear camera, this Apple iPad enables you to capture stunning, high-quality images with amazing clarity. My review of this iPad comes from my personal experience with used models, and should be taken into consideration when deciding to purchase. The 1st Generation iPad air is a good follow-up to the 4th generation iPad. The slender lightweight design, make it easier to hold for long periods of time. I don't notice any difference in the battery life, or screen sharpness compared to the older model. However, replacing the digitizer, takes more patients, and caution, due to the closer proximity of the LCD to the edge of the frame. I got a great deal through eBay and am very happy with the iPad. My only issue is that it takes hours and hours to recharge and cannot keep up (with staying charged) with being used while plugged in. It may not be my device, but the charger as it did not come with its original charger. Otherwise I love how easy and familiar it is to use! Overall, was a good value. Supports Apps, quality of picture is good. Downside - Apple has moved on so accessories like covers must be purchased off of Amazon (no big deal). Speed is so-so on the 4 - not super fast. I am using for display and small work items at promo events. It is PERFECT for this. As a business person, if I used for work, the speed would become frustrating. I would purchase again for what I needed. I also feel this would be a good cheaper option for kids to play games, watch movies etc. Cheaper as well so if it breaks, oh well. If I had to buy for business use, I would buy the iPad pro based on performance. This iPad is Amazing. My little son and I (of course), we are very happy using it. This is the second iPad both from this seller and is awesome. Thank you. A++ iPad, very-very fast shipping (I got it in 3 days) time. Thanks. The display is crystal clear, no scratch, fully functional. I'm very happy with this purchase. Awesome. My daughter just used for above one hour and battery life seems to be good to; from 100% to 87% in one hour that means around 10 hours with a charge. Amazing. I'm really happy with this purchase.